MONCLAIR, NJ — Family and friends from across the globe, gathered to celebrate the life and legacy of Martha Rivera Chavis in a multicultural service, just a few blocks from her Montclair, N.J. home. Martha died at the age of 53 of natural causes in her home on July 6, due to complications of heart failure. 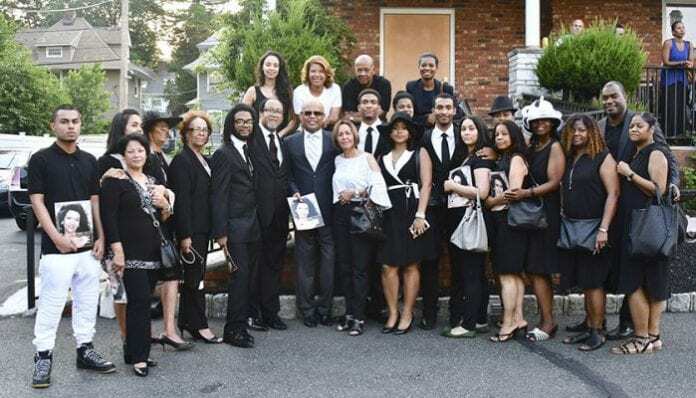 The Chavis-Rivera family hosted Martha’s memorial at Martin’s Home for Service, Inc. on Tuesday, July 11; the printed program featured her obituary in English and Spanish. Dr. Chavis thanked Jim Farmer of General Motors; the Murphy, Falcon and Murphy law firm in Baltimore, Md. ; hip-hop and business mogul Russell Simmons; the President of the Detroit branch of NAACP Rev. Dr. Wendell Anthony and many others for their contributions and generosity. 6, due to complications of heart failure. Dr. Chavis thanked Jim Farmer of General Motors; the Murphy, Falcon and Murphy law firm in Baltimore, Md. ; hip-hop and business mogul Russell Simmons; the President of the Detroit branch of NAACP Rev. Dr. Wendell Anthony and many others for their contributions and generosity. Many of the speakers during the memorial service met Martha and Dr. Chavis in the late 80s, when Dr. Chavis served as the executive director for the United Church of Christ’s Commission for Racial Justice (CRJ) in New York City. Newark, New Jersey Mayor Ras Baraka, who was a student at the time, offered his condolences. Baraka said that the couple did a lot for the Black community in the United States and for Black people around the world, especially those who were oppressed and struggling. Author and activist Sister Soulja also said that she met Dr. Chavis, when she worked at CRJ — before he met Martha. Sister Soulja described Martha as jovial, jubilant, energetic and very, very loyal. “It’s very nice when you see a woman who is just 1000 percent behind her man; that was one of the most beautiful things about her,” Sister Soulja said. Minister Abdul Hafeez Muhammad, New York representative of the Honorable Minister Louis Farrakhan and the Nation of Islam, said that he met Martha when Dr. Chavis served as the east coast regional minister of the Nation of Islam. Min. Abdul Hafeez Muhammad also noted the importance of women in society and in the work of the Hon. Elijah Muhammad. Loved ones honored Martha’s family and life’s work offering thanks and remembrances in English and Spanish. Dr. Chavis met Martha when she worked as a translator for the Ambassador of Angola; she spoke Spanish, Portuguese, French, Italian and English. Ana Jacobo said that Martha was more like an older sister than an aunt. Rubby Perez, a family friend and world-renowned singer from the Dominican Republic, honored Martha with two songs in Spanish, “Amor Mio,” and “Hay Momentos.” Perez wanted to sing “Hay Momentos” at his father’s funeral, but because he wasn’t able to sing that day, he wanted to make sure that he performed it at Martha’s service. Perez said that Martha Rivera Chavis had the unique ability to make people feel good even when she was feeling sad. After the ceremony, family and friends gathered outside to take pictures as songs like Whitney Houston’s “I Wanna Dance with Somebody,” Faith Evans’ “Love Like This,” and Gloria Estefan’s “Rhythm Is Gonna Get You,” played through the speakers on the warm, summer day. John Chavis, one of Martha and Dr. Chavis’ sons, said that he’ll always remember his mother’s kind heart and willingness to help anyone. John said that about a week before she died, his mom was looking out of her window and saw an African American woman trudging up Union Street with a heavy basket on her back attached to a leather tumpline. The midday sun was sweltering. Even though she wasn’t feeling well, she came outside in her pajamas, crossed the street and gave the lady a cold bottle of water, John said.